It’s that time of year where we all want warming, cosy meals that make us feel full and content. If you’re Canadian or American, it’s also that time of year where we celebrate Thanksgiving. Maybe you’re having someone over who doesn’t eat meat and you have no idea what constitutes vegan Thanksgiving food, or maybe you’re plant-based yourself and are just looking for some new holiday food options. 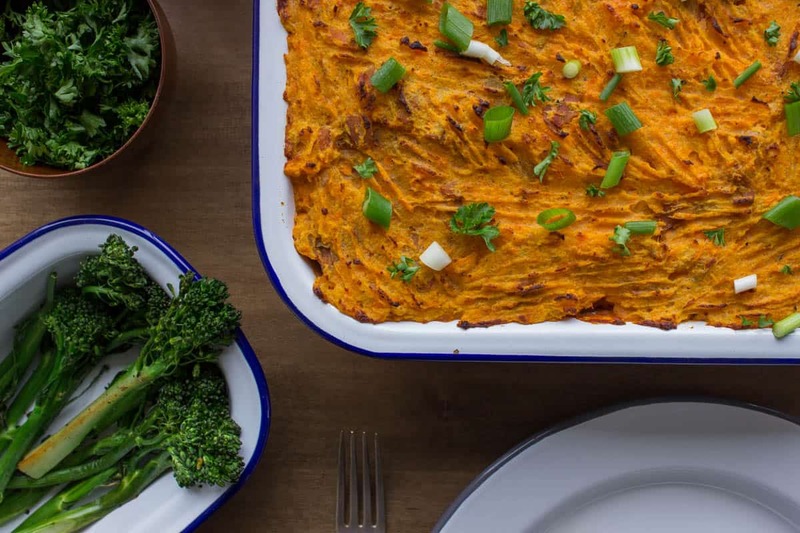 This delicious Vegan Shepherd’s Pie with Yam Mash is a little different to standard vegan Thanksgiving dishes, but that’s why I like it. As a nod to tradition, yams still play a central role in this dish, but I’ve mixed it up by adding beans and aubergine/eggplant to create a beautiful, textured meal that is as filling as it is tasty! 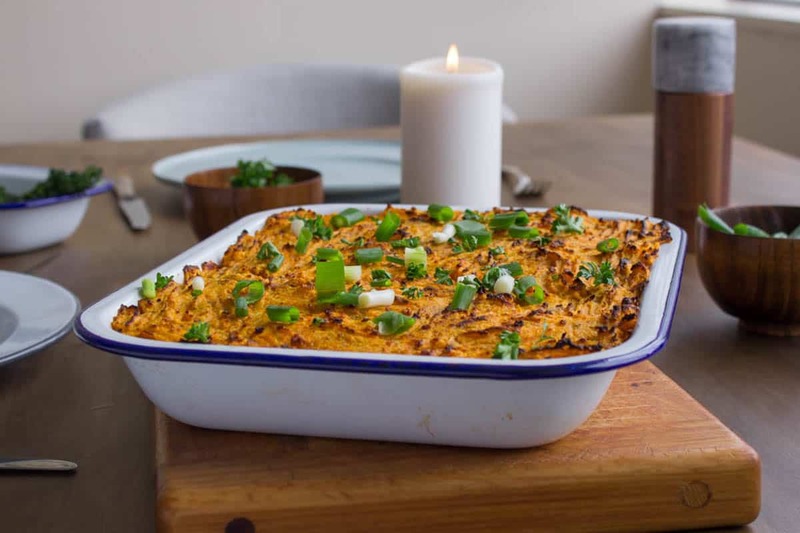 It’s also quicker to make than a traditional Shepherd’s Pie as it doesn’t get baked in the oven – instead it just gets placed under your oven’s grill/broiler for 10 minutes to crisp the mash. This not only reduces cooking time but helps retain nutrients in the vegetables. 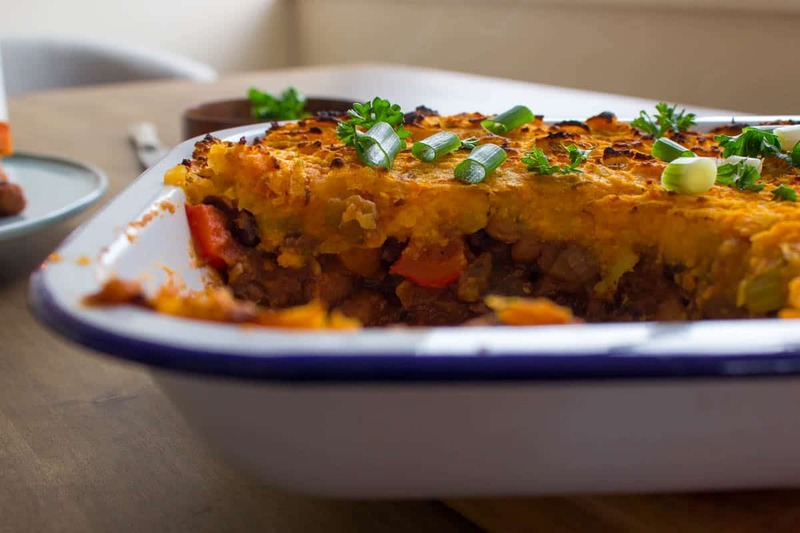 If your kitchen game is strong, you could just about make this Vegan Shepherd’s Pie in 1 hour but I’ve allowed a little extra time to compensate for the fact that we’re not all Nigella. Also, feel free to substitute ingredients in this dish as you see fit – if you don’t have an aubergine, use mushrooms instead. If you don’t have black beans, use white. Get creative! Sauté the chopped onion in a large pan for 5 minutes on a medium heat. Use a little water to coat the pan so that the onion doesn’t stick. Add the celery and garlic and continue to sauté for another 5 minutes. Add the carrot, aubergine/eggplant, beans, crushed tomatoes, stock/broth, Braggs, coriander and mixed herbs to the pan and bring to a boil. Reduce the heat and simmer – stirring frequently – for 15-20 minutes or until the vegetables are tender and cooked through. Remove from the heat and set aside. For the mash, place only the yellow/white cubed potato in a medium saucepan and cover with water. Bring to a boil and simmer the potato for 5 minutes. Add the yam/sweet potato to the saucepan and continue to simmer for 10 minutes, or until both types of potato are cooked. Drain the water from the potatoes and add in the coconut oil and salt/pepper. Mash the potatoes thoroughly with a potato ricer until they are fluffy and smooth. Pour the pie filling into a deep oven-proof dish (about 12″x10″ is ideal) and spoon over the mash. 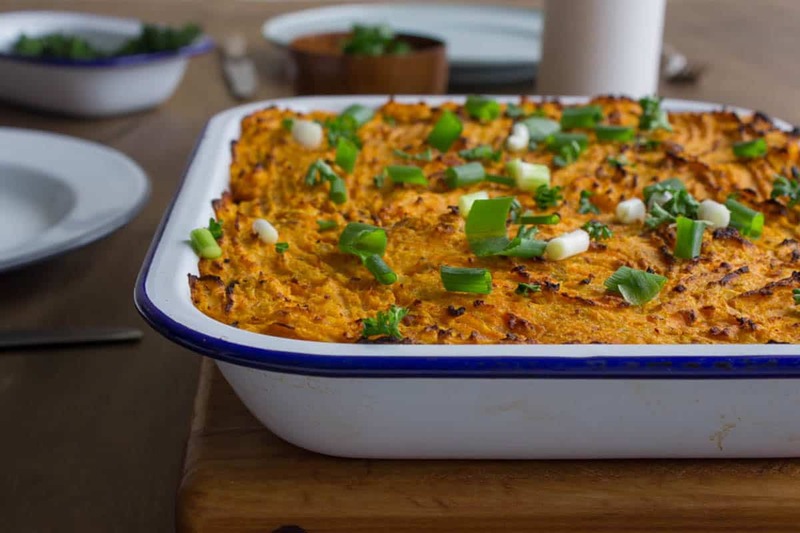 Use a fork to spread the mash evenly, ensuring it covers the filling. Place the pie under your oven’s grill or broiler for 10 minutes until the mash is crispy. Serve with steamed broccoli, kale and any other greens you fancy!